Having a business in Mill Valley, Ca. starting in 1992, I worked on residential remodels and additions. I have designed homes from the ground up from 2002-2014. Here are some examples of my work. Exterior rain screen system of Parflex has been added to a new Addition to a 1965 A Frame- new windows and doors. New House steps to conform to a tight building area. Free-standing New Garage with Art Studio, Gym, Guest Bedroom and Office on Second Floor. New House with Green roof over the three car garage. Coppola over the kitchen brings in light. Green Roof over a Garage allows deer free zone without a fence and extends habitat for birds & bees. Back of house with covered back porch and rooms opening onto a huge entertaining deck. New Construction Timberframe with real rock masonry cladding on lower floor. From the rear, the house blends into the trees. 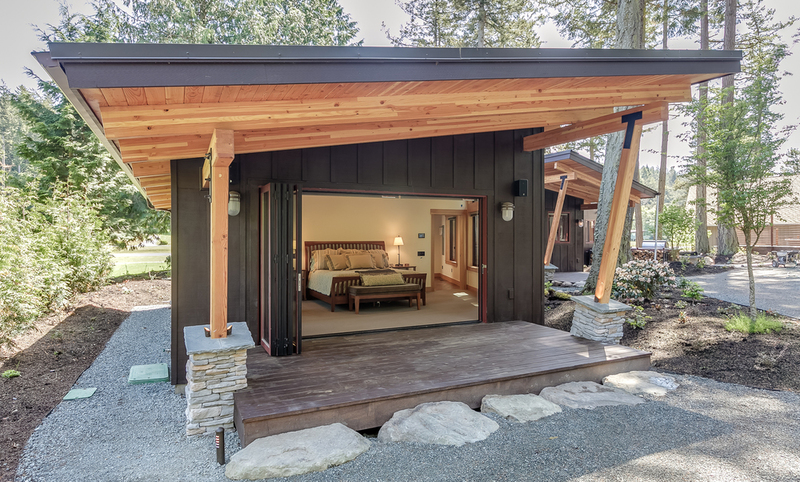 New Construction with jetting over hang on this Master Bedroom covered porch wing and folding doors open to bring the outside in.